Sadly, strawberry season is beginning to wane here in northern California; however, the news is not all bad as the raspberries and cherries are ripening in my garden. 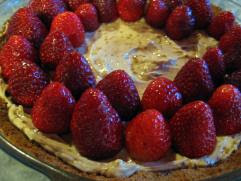 This delicious recipe for Organic Strawberry Almond Cream Cheese Tart came from my friend Laura. Our town hosts a good old-fashioned pie auction every spring to raise money for our community council. Laura made this tart one year, and it sold for almost $200 at the pie auction. Fortunately, a friend bought it, so I was able to try a piece and begged Laura for the recipe. This Organic Strawberry Almond Cream Cheese Tart is amazing, with just the right combinations of ingredients. The tart is light, using very little sugar and fresh strawberries. My tarts never turn out as beautiful as Laura’s high priced one, but the taste is one I look forward to every strawberry season. This recipe is modified from one published in Cooking Light magazine. Of course, bakers should use organic ingredients to make this recipe pesticide free! I use organic Sucanat , which stands for Sugar Cane Natural, for all my baking. Sucant is Fair Trade certified from Costa Rica and is made by crushing sugar cane, extracting and heating the juice, then hand paddling the juice until it dries into porous granules. Unlike refined sugars, Sucanat retains many vitamins and minerals present in sugar cane, such as iron, calcium, vitamin B6, potassium, and chromium. To obtain the full recipe, please visit Green Options Weekend Grub: Organic Strawberry Almond Cream Cheese Tart. OOO, wonderful recipe. And thanks for te info on sucanat, I’ll be looking into that some more. I’ve been using Sucanat for 15 years as our exclusive granular sugar. I love the flavor, but some people think it is too strong. It makes the best cookies ever! That is a very good recipe.